New Release! Book 7 in the Brides with Grit is now available! A sweet wholesome romance set in 1873. Darcie Robbins fled St. Louis to protect her two children from their bad father. Now divorced, she’s temporarily working on the Bar E Ranch in central Kansas. She needs a permanent job—or a trustworthy husband—to help provide for her family. Looking through old photos I used in the book Prӓrieblomman (which means prairie flowers in Swedish) I came across one of Alma Swenson, posing for a portrait to commemorate her 8th grade graduation. Many of my blog readers enjoy excerpts from my books, so here’s the start of Prӓrieblomman. For your sixteenth birthday, I am giving you a blank book of pages. This may seem odd to you, but I want you to write down the normal and unusual events that happen in your life. You don’t have to write every day. Just scattered tidbits of thought, misgivings and joy will record the growth in yourself and the happenings in the world around you. Years later this book will bring back smiles and tears to help you recall favorite places you never meant to forget, cherish lives lost, and to see how yesterday’s events become tomorrow’s history. Someday you may want to show your children the changes you saw while growing up on this farm in Kansas. Keep this book with you always. Your written memories will sustain you when you have moved on to a prairie of your own someday. Snow blankets the homestead on this quiet Sunday afternoon in 1889. Silent white-iced furrows in the fields of the 159 acres wait for spring planting. The height of bare-branched trees shows the farm to be about twenty years old. You can tell that the farmer is prospering because there are several outbuildings, and the wooden two-story house has been added onto a time or two. The dirt road running by the farm was just a trail not too many years back. Life and growth have progressed for the family, but there are still patches of native grass beside the homestead to remind them of their start on the prairie. Peering into the parlor window facing south, you get a glimpse of petite Alma Swenson, an optimistic young woman with typical Swedish blonde features, innocently pondering her life as she turns sixteen. Sunday dinner dishes are done, little sisters are napping, and I have a few moments to myself. As I turned the white porcelain doorknob and slipped into the cool, closed-off parlor, I pondered about the book of blank pages Mamma gave me today for my birthday. On the first page, she wrote a note, encouraging me to write. Mamma has kept a diary ever since she moved to Kansas in 1868. I’ve never read it myself, since it is personal, but sometimes Mamma reads bits to us. A diary entry may make her smile or bring tears to her eyes. Her journal tells the trials and errors as she and Papa built their homestead on the virgin prairie twenty years ago. When they arrived as Swedish immigrants to this land by the creek, the blue stem grass was as high as a man’s head on horseback. With their bare hands and a few primitive tools, they cleared the land, dug a well, and fashioned a sod dugout home. Clashes with Mother Nature, Indians and animals as they struggled to coax crops out of the broken sod almost took their toll on Mamma’s spirit, but she had a family to feed and protect. Favorite entries tell when her children were born and the joy of uniting with families when my grandparents left Sweden and moved to America. The dugout was replaced by a sandstone one-room house in 1870. The house has been built on to three times with wooden additions when we could afford to buy lumber. The barn and granary were originally makeshift buildings for temporary storage of the crops and animals. As of yet they have not been replaced. A sod and straw-roofed open shed shelters the animals when they are out in the elements and the chicken house guards the fowl flock at night. Most of the acres of prairie have been tamed into fields for crops except for the hay meadows along the creek. Us older children are almost grown now. Christina is twenty-two and getting married next month. Willie turned nineteen the fourth of this month and Alfred is fifteen. Carrie, who was born after Papa was killed, is twelve. When we needed help on the farm, Peter Runeberg came into our lives as a hired hand, and five years later, he and Mamma were married. Our half-sisters, Julia, born four years ago and Mabel, last March, have livened up and further crowded our household. Peering out the window at the drab sleeping field to the south, I ponder over Mamma’s note. Maybe someday I will cherish my thoughts and reflections, the everyday events that have taken place on our farm. I wonder, since I finished my country schooling last year . . . what will my future bring? Will I marry soon and start a family or spend my life here on my Mother’s farm, tending to the everyday tasks that must be done to sustain life? Look at the details in this dress. I imagine today’s teenagers probably spend as much time in a mall shopping for an outfit as Alma spent on the tucks in this skirt…or texting, when Alma would have been hand sewing little pleats. Clothing styles change each generation and many times in a decade, but a photo from the 1880’s gives us a good glimpse of the past. Can you find the well? The first home on the “Butter in the Well” homestead was a dugout. Two years later in 1870, the Svensson family built the first section of their wood-frame house. They added on at least two more times over the next two decades. Here are excerpts from Butter in the Well, as well as a copy of the first photo taken of the house in 1881. It shows the front of the house, which is the second addition to the house. The stone section was on the west side and did not show on this photo. We finally have enough stone to start building our house. We have been collecting sandstone rocks whenever we come across them in the field or the creek. It has been hard to find enough rock nearby. Yesterday Carl picked up the last wagonload of local rock. There is a rise of hills two miles south that has an outcropping of stone. The rains last week loosened the sod enough that it was easy to dig out the rocks with a spade and pick. The cellar is dug. It will be used as storage for our preserved food, and as a root cellar for our vegetables and fruits from the garden. We also need a place for shelter from tornadoes, the cyclone winds that Kansas is known for. We’ll have one entrance to the cellar from outside on the north, one from the porch on the south and one inside the house. After the stone walls are in place in the cellar, and the floor is laid for the house, I want to move into the cellar. We’d have more room than in the dugout and the cellar floor seems drier than the dugout floor. We have had water seeping up from the floor of the dugout this spring. It is always muddy and doesn’t want to dry out. It will be so nice to get out of the damp ground and live on a wooden floor when the house is done. Our house will measure 16 feet square. Imagine all the space we’ll have. It will consist of one big room with a loft above it. We hope to add on more rooms as we have the time and money. Carl bought glass for three windows, a door, shingles and more lumber when he was in Salina last week. One window will go in the middle of the west wall, one in the middle of the south wall, and a little window in the west end of the loft. The front door will go in the southeast corner of the house. Carl also bought a big cooking stove with the money he received from selling some of last year’s wheat. It will go on the west wall, just to the right of the window so I can gaze out at our farm while I’m cooking. We’ll have a ladder on the east wall to get up into the loft, which we’ll use as storage and for an extra bedroom. I’d like to add a porch to the south eventually. Then I can sit and watch the children play while I’m sewing, snapping beans or whatever needs to be done. Rock by rock we are slowly building the walls. We are mixing a plaster of sand, clay and lime to cement the rock together. Benjamin and Mr. Lapsley are helping today. Adelaide came over to watch the progress and help me fix the meals for the extra hands. As I stood inside my partially built house tonight, I tried to imagine what it will look like when it is done. I want to put up red gingham curtains that I can tie back during the day, and braid some rag rugs for the floor. The old hides have worked well in the dugout, but I want our new home to look like a real house, like the one we had in Sweden. With four growing children, our house has become too small. We had hoped to add on sooner, but it hasn’t been possible until now. It is going to be an American two-story frame house. I will have to move my flower bed from its place on the east side. I’ve collected wildflower seeds in the fall from the open prairie and now I have a beautiful variety of flowers around our home. Columbine and daisies bloom in the spring. I enjoy the primrose and phlox in the summer and the goldenrod and asters in the fall. The wild rose roots I dug up have spread everywhere so I have a nice stand of them. I throw my wash water on the flower beds when I empty the tubs, so they are well watered. I love the splash of color the flowers have added to the homestead. We dug up several small cedar and ash saplings from the riverbank and transplanted them around the house, but they are out far enough that they won’t have to be moved. We have bought lumber, glass for windows and doors to build on four rooms. We will add two rooms to the east part of the stone room, with two rooms directly above it. Since the cellar is already a nice size, we will not dig a basement for the new section. Carl will put in a staircase to the upstairs and seal off the hole in the ceiling we have been using to get to the loft. We’ll add a door to the side of the loft at the top of the stairway and use that area for an attic. The southeast room will be our bedroom. A smaller bedroom to the north will be used as Alfred’s nursery, and we’ll have a storage closet under the stairwell. A stove in our room will heat the new section of the house. At the top of the stairs will be one small room for Willie and a larger room to the south for the girls. The girls are excited about having their own room, away from their brother! The upstairs will be cold during the winter, but the children can come downstairs to dress in front of the kitchen stove. The walls will be plastered and eventually papered. There is enough wood for trim inside around the windows, doors and baseboards. I’ll need to make more curtains and Carl will have to make more furniture. Carl even bought extra siding to cover the sandstone walls on the old part of the house. After we paint, the house will be done. Perishables, before the days of electricity, were kept in crocks and buckets, and lowered down with a rope into the well to be stored right above the water level. The well was a cool place to store food that would otherwise spoil. According to a family story, one time the rope broke so there is a crock of butter in the bottom of the well. Now you know how I came up with the title for this book, Butter in the Well. I’m so hot and sweaty today. But I need my long-sleeved dress to protect me from the sun’s burning rays and the insects. We’ve been digging on the well for days. Carl fills the bucket up with dirt from the bottom of the hole, then I pull it up by a rope, dump the bucket and send it back down to him. He is very discouraged. First we almost get flooded out by the creek, and now we can’t find any water. The creek runs through our land, across the south and up the west side until it empties into the river on the next section to the north of us. We moved our little camp into the middle of our farm on the far east edge since we know the creek can surprise us with a flood. Again we started the process of digging the well, one scoop at a time. Today we were rewarded with water. Today we start digging our home. I hate to live in the ground, burrowed in like a gopher, but we can’t afford the lumber it takes to build a house. What lumber we did find money for will be used sparingly. People say being in the ground protects you from the heat of the summer day and the freezing cold of winter. It will only be about 10 by 12 feet in size, just enough for our bodies and belongings. I’ll continue to cook outside on an open fire. We’ve scoured the creek for rocks to reinforce our walls. For our dugout to be a legal homestead house, we must have one window in it. We bought a small pane of glass in Salina that Carl will frame and put next to the door. Carl left ledges along the inside walls of the dugout to use for sitting and sleeping. He dug two additional recesses, one for a safe spot to sit a candle and another to hide our food away from the vermin.We cut strips of sod, about 12 by 18 by 2 inches, and laid them around the edge of our hole to build walls 3 feet high. This will give us the extra height to stand the door upright on the south end. Carl chopped down one tall straight tree by the river for the ridgepole. Fallen timber from the river and a few boards make up the roof rafters that were to nailed the ridgepole. We had a wagonload of tree limbs that we weaved in among the Next, dry grass, from around the house was layered on, then sod blocks on the roof. We threw dirt back on the roof from the hole that was dug. Just another day or two and we’ll move in. We saved the hard layer of sand from when we dug the well. This sand, and clay from the river bank, were mixed with water to plaster the walls of the dugout. It’s very crude, but it will have to do for our first winter. The dirt floor will get packed down in time. I’ll sprinkle my dishwater on it to help it harden. I wish we had rugs to cover the floor. It would make it warmer and easier to keep clean. I talked Carl into cutting up one board for a door. At least I’ll feel a little safer at night with it closed. The hungry howling of the wolves scares me. Our sparse belongings from the wagon have filled the dugout in a hurry. Carl made two chairs out of a log he sawed up. Another board was fashioned into a table. The crate that held our supplies will be my cupboard. A lean-to bed is braced on the right side of the dugout, half on the ledge for support. Christina’s cradle fits under our bed when the cradle is not being used. A crude mattress was fashioned out of ticking filled with “prairie feathers.” I’m glad we brought along the bedding from our house in Jacksonville. Carl found some old buffalo horns when he was out walking. He nailed them up to the wall to hang our clothes on. We hung the wagon sheet up as our ceiling for the dugout today. Last night there was a rattlesnake dangling from the rafters above Christina! Lord give me strength. I cannot get used to those things. Fear runs down my spine every time I see one. I’m tired of the snakes, mice and insects that drop down on us by surprise during a meal or during the night. Now that the weather has warmed up, the snakes are everywhere. I’m petrified one of us will get bitten and die on the spot. We were down at the creek yesterday for a few hours and came home to six vipers sunning themselves on the south side of the dugout. We’ve trampled down the grass around our “home,” but it does not seem to deter the snakes. I must carry a big stick wherever I go, so I can beat them out of our path. I can’t let Christina out of my sight now that she’s starting to walk. Be sure to come back to this site next week as I’ll post the first photo of the homestead I have, taken in 1881, that features the Svensson’s new wood-frame home. I’ll post an excerpt from my book, Butter in the Well that goes with it too. I love looking at old photos collected on historical internet sites like KansasMemory.org. One of the most famous photos, that of a woman gathering cow chips, depicts the typical life of a pioneer woman in many people’s minds. Here’s this woman, stuck out on the Western Kansas plains, with nothing but the flat prairie behind her—and she’s gathering dried buffalo manure to use as fuel to cook her family’s meals. That was life for the women homesteading on the plains with no trees for fuel. Unless you lived on a river that had trees on its banks, you were pretty much out of luck. Prairie fires kept trees from foresting the Plains before towns and farms changed the landscape. So you gathered whatever you could find to burn, and people soon found out that dried manure gave a nice slow burning heat. However, one of the interesting internet links with this photo on the Kansas Memory.org site is the story behind the staging of this picture. Yes, a young woman that wanted to be a photographer set it up. In 1893 Ada McColl posed for her camera, and her mother Polly actually took the picture featuring Ada, and her little brother Burt, (mistaken for a girl because of his clothing). You can read the whole story of the Pioneer Photographer: The Story of the Cow Chip Lady in this link (then scroll down to page 10). I always wonder about the people and scenery in old photos, so it was neat to find the story behind this particular one. Even though Ada staged the shot, it was a common chore for many a woman on the Kansas prairie in the 1850-1870s. Ada would have used her family’s cow herd’s dried manure to fill her wheelbarrow because the buffalo herds were gone from the state twenty years before this picture was taken. But Ada gave us more than a glimpse of how the first pioneers scrounged for buffalo chips after a herd passed through the area. She showed the view of the endless prairie in the horizon, the taste and smell of the dirt blowing on her face from the constant wind, the dry gritty feel of the dried manure on her hands, and the weight of the wheel barrow. Need to finish your Christmas shopping? Or maybe start your shopping? I heard from one reader that bought a Kindle as a gift, and was downloading books for the recipient to read right away. She had downloaded my TRAIL OF THREAD series and read them before she wrapped the Kindle in Christmas paper! Smart gal! Remember you can “gift” an ebook to someone by just hitting the “give as a gift” button on the right side of the screen when ordering through Amazon.com. The receiver will get an email notifying them that they have a book to download onto their Kindle. I like to read paperbacks, but ebooks are very popular so I give both as gifts. Here’s my pioneer series that has a quilting theme to it for your quilting friends (or yourself if you get a Kindle or Nook for Christmas). 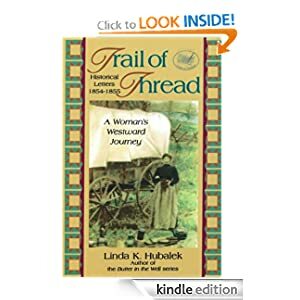 In the first book, TRAIL OF THREAD, Deborah and John Pieratt left Kentucky in 1854 when the Territory of Kansas opened to homesteaders. They were part of the thousands of families that packed wagons and headed west for the promise of a new life. This progression leads them to own land for their family of six young children. Orphaned Maggie Kennedy (my great-great grandmother), portrayed in STITCH OF COURAGE, the last book in the series, traveled to Kansas looking for her brothers as the states fought out the history of the Civil War. While this might seem as a step backwards due to the times, it leads her to marriage and a family of her own. Sound like a book series someone you know would like? Maybe this idea will finish your holiday shopping! I got an email from another author with this headline today and I thought—this statement is so true. The author was promoting his books for the Christmas season, and it was a good opening line. I like the statement because the stories written in my books are gifts of insight to me—and the descendants of every pioneer that homesteaded out in the middle of nowhere. But, the line can imply other things too. A great story will share the history from one generation to the next. That’s a gift of heritage and pride in one’s family. A great story may calm a child—or an adult— in a crisis. That’s a gift by preventing further trauma and frightful memories. A great story can be seen and felt through a keepsake quilt, or through the lines of a poem, giving the gift of a visual memory. I hope today you get—or give—a great story to remember the day, or a special person by. What’s your greatest story that was a gift to you? While we’re ordering our holiday gifts online today because of Cyber Monday sales, I can’t help but think of the contrast of now, versus 150 years ago, when Kansas was being homesteaded by pioneers of several different nationalities. We celebrated the American holiday called Thanksgiving with the Robinsons today. We were thankful to be asked to their home. They live in a dugout too, but have two rooms and real furniture. Benjamin had shot a turkey down near their bend of the river. He said that turkey is the traditional meat for the Thanksgiving meal back East. But Adelaide also fixed venison, potatoes, creamed hominy corn, pickled beets, fresh wheat bread (I had two thick slices) and dried currant pie. Since she has a cow, we also enjoyed fresh butter and cheese. Adelaide sent home a wedge of cheese and a loaf of bread. She is so thoughtful. Since Carl is spending most of his time inside now that it is cold, he has been carving. He has made some wooden spoons and small bowls for me, and tool handles for himself. He carved a doll’s head and I added a little body for it out of one of Christina’s first dresses. It will be her Christmas present. Carl bought a two-lidded stove in Salina this month to heat the dugout and so I could do some of my cooking inside. It is a very small second-hand stove, but better than cooking everything outside. Gifts were given and received, be it food or a hand-carved item, with thought and love back then. And, actually we’re still doing the same things now, only with a different means of obtaining them. Have fun today as you think of Christmas gifts to give to others. Will you hand make some items this year, or order them online? P.S. If you’d like to read more about these Kansas pioneers, or would like to give them as a holiday gifts, the Kindle and Nook ebooks are on sale this month as Butterfield Books Inc.’s Cyber Monday special. Or, you can buy autographed books on my website, where you always get free shipping. Happy Shopping and Giving!